This entry was posted in Word 365 ProPlus English and tagged backstage view, Choose The Desired Location To Upload Our Document, Clipboard, Copy Path, Document, How To, Know How, Microsoft Excel, Microsoft Office, Microsoft Outlook, Microsoft PowerPoint, Microsoft Word, My YouTube Channel, Name, Notepad, Office Files, Office Smart, Office System, OfficeSmart, Open File Location, PDF File, philippospan, Share, Smart Office, smartoffice, Subscribe, Tip & Tricks, Upload, Upload A Copy Of Our Document To OneDrive To Share, Which Are The Updated Features for Info for our Office Files;, Windows Explorer. This entry was posted in Word 365 ProPlus English and tagged backstage view, File, How To, How To Recover Unsaved Microsoft Office Files, Know How, Manage Document, Manage Presentation, Manage Workbook, Microsoft Excel, Microsoft Office, Microsoft Outlook, Microsoft PowerPoint, Microsoft Word, My YouTube Channel, Office Smart, Office System, OfficeSmart, philippospan, Recover Unsaved Documents, Recover Unsaved Presentations, Recover Unsaved Workbooks, Restored, Smart Office, smartoffice, Subscribe, Tip & Tricks, Unsaved Word Documents. This entry was posted in Word 365 ProPlus English and tagged How To, Know How, Microsoft Excel, Microsoft Office, Microsoft Outlook, Microsoft PowerPoint, Microsoft Word, More Space Between Commands, Mouse Mode, My YouTube Channel, Office Smart, Office System, OfficeSmart, philippospan, Quick Access Toolbar, Smart Office, smartoffice, Standard Ribbon and commands, Subscribe, Tip & Tricks, Touch Mode, Touch/Mouse Mode, which are Optimized For Use With the Mouse, which are Optimized For Use With Touch. This entry was posted in Word 365 ProPlus English and tagged Down, Header & Footer, How To, How To Change The Page Numbering In An Excel Spreadsheet?, Know How, Margins, Microsoft Excel, Microsoft Office, Microsoft Outlook, Microsoft PowerPoint, Microsoft Word, My YouTube Channel, Office Smart, Office System, OfficeSmart, Options, Over, Page, Page 1, Page Break Preview, Page Formatting, Page Layout, Page Setup, philippospan, Sheet, Smart Office, smartoffice, Spreadsheet, Subscribe, Then Down, Then Over, Tip & Tricks, Workbook Views. We must select the View tab, and then from the left area of the ribbon we locate the area named Workbook Views as shown in the image below. 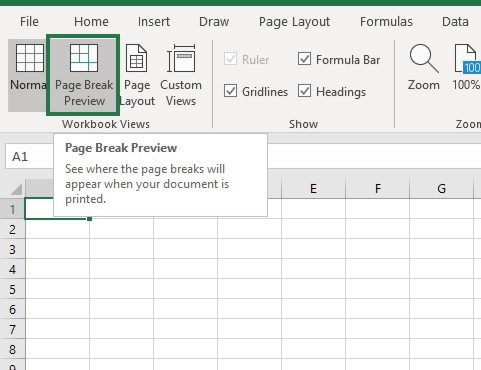 Once we locate the Workbook Views area, we select the command Page Break Preview, where we will be able to See Where The Page Breaks Will Appear When Our Document Is Printed. 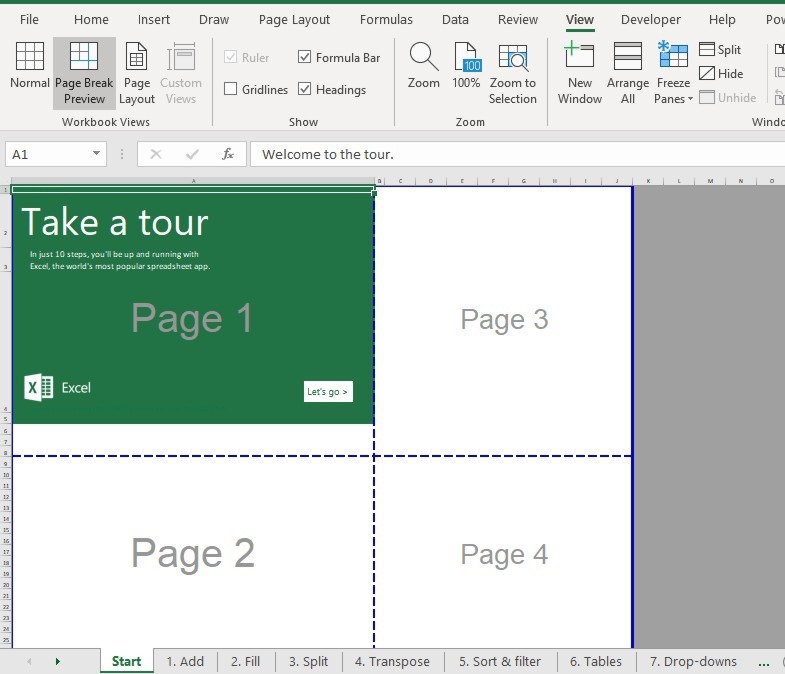 In the image below, I have selected the Page Break Preview, where we can see the actual page that will be printed when we decide to. We notice the Page 1 lettering in the middle of the Spreadsheet (which will not be printed) and we notice a Horizontal and Vertical Blue Line which define where the Page ends. The Horizontal and Vertical Blue Line defines a Manual Page Break that we have inserted. If we need to adjust the Page Break manually, all we need to do is to click and select either the Horizontal or Vertical Line, or where the lines intersect at the bottom right corner and then drag them with our mouse to the position needed as shown in the image below. Once we have dragged the lines to the position needed, we notice now that we have four (4) Pages in our Spreadsheet. We also notice that the Pages order goes from Top to Bottom and then from Left to Right, a feature that can be changed and will be described in a future post of mine. We also notice that we have besides the Straight Blue Lines (both vertical and horizontal), Dotted Blue Lines Vertical and Horizontal. The Dotted Blue Lines Vertical and Horizontal means that they are Automatic Page Breaks. If we want to Insert our own Page Breaks and not to use the Automatic ones, we must select the Page Layout tab and then locate the area of the ribbon named Page Setup as shown in the image below. 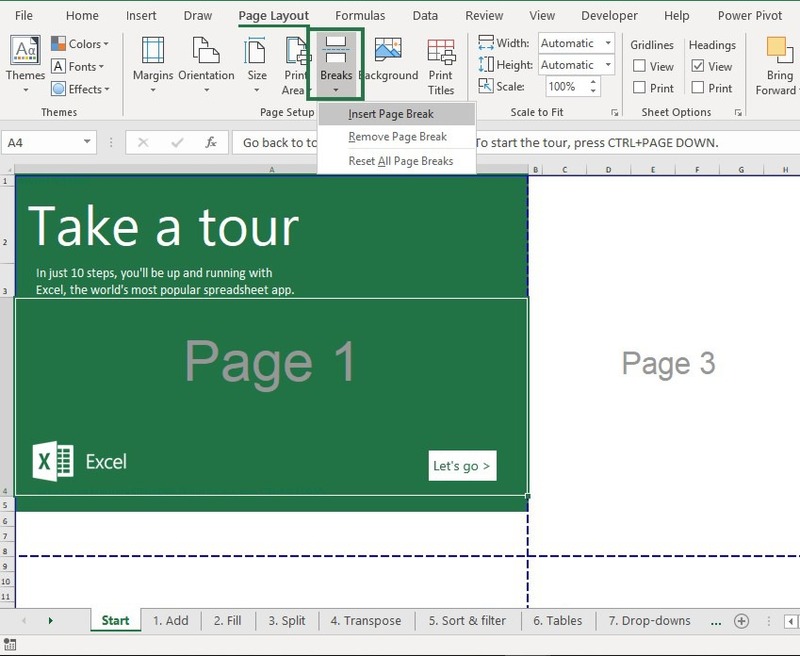 Insert Page Break: A Page Break will be inserted depending which is the activated Cell in our Spreadsheet. Remove Page Break: The Manual Page Break that was inserted will be removed. Reset All Page Breaks: All the Manual Page Breaks will be removed and only the automatic page breaks will be displayed. 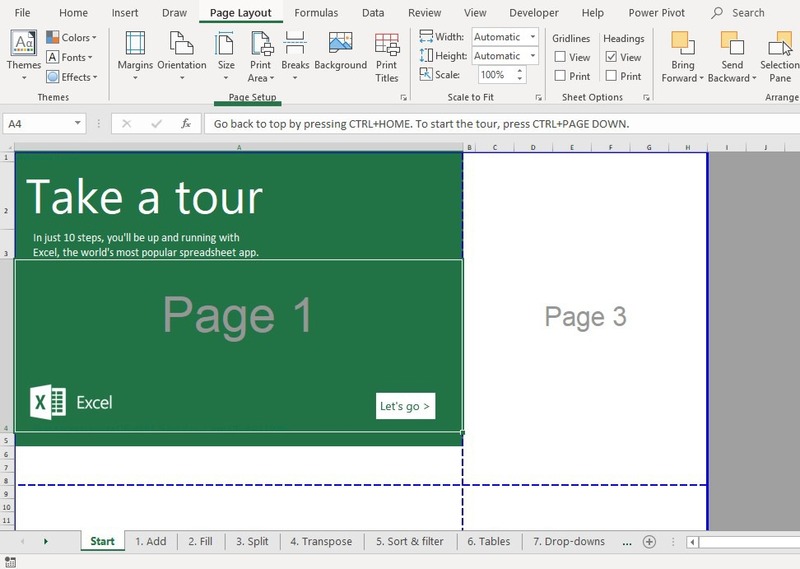 If we want to Insert a Vertical Page Break, we must select the Row below where we want the Page Break to be Inserted. 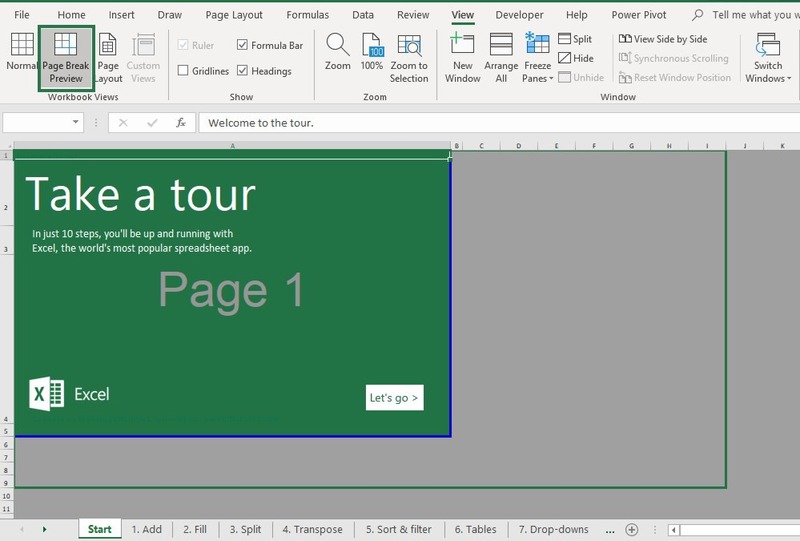 If we want to Insert a Horizontal Page Break, we must select the Column to the right of where we want the Page Break to be Inserted. 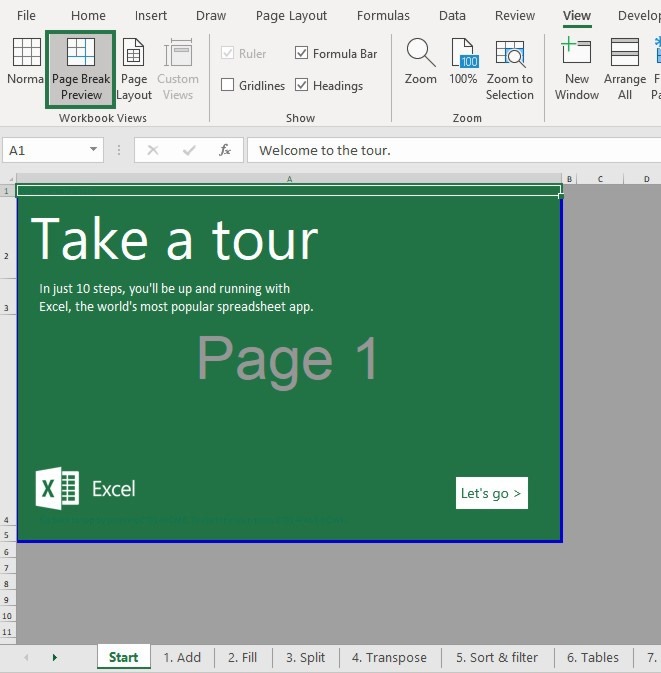 Another way to Insert a Page Break in our Spreadsheet, we just activate the Cell needed and then do a right click with our mouse. From the shortcut menu that appears we select the command Insert Page Break as shown in the image below. 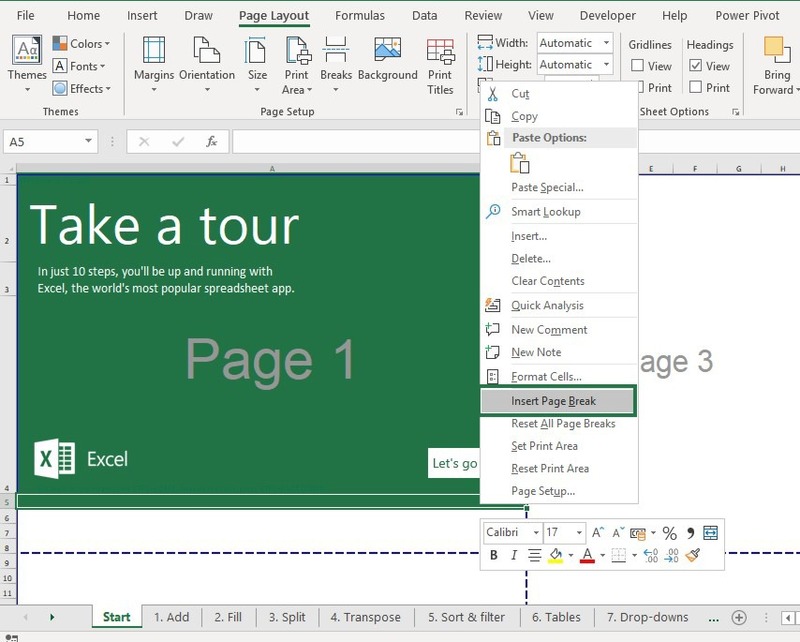 Below you can check out the video describing How To View, Insert or Edit Page Breaks in Excel. This entry was posted in Word 365 ProPlus English and tagged Horizontal, How To, How To View, Insert or Edit Page Breaks in Excel, Insert Page Break, Know How, Manual Page Breaks, Margin Settings, Microsoft Excel, Microsoft Office, Microsoft Outlook, Microsoft PowerPoint, Microsoft Word, My YouTube Channel, Office Smart, Office System, OfficeSmart, Page Break Preview, Page Breaks, Paper Size, philippospan, Remove Page Break, Reset All Page Breaks, Smart Office, smartoffice, Subscribe, Tip & Tricks, Vertical Blue Line, Workbook Views, Worksheet. This entry was posted in Word 365 ProPlus English and tagged Before Sheet, Copy, Create A Copy, How To, How To Copy or Move A Worksheet in Excel?, Know How, Microsoft Excel, Microsoft Office, Microsoft Outlook, Microsoft PowerPoint, Microsoft Word, Move, Move Before the Selected Worksheet, Move Selected, My YouTube Channel, New Book, New Location, Office Smart, Office System, OfficeSmart, Open Existing One, philippospan, Sheet, Sheets To Book, Smart Office, smartoffice, Subscribe, Tip & Tricks, Worksheet. This entry was posted in Word 365 ProPlus English and tagged Cell, Cells, Chart, Column, Columns, Columns and Spreadsheets in an Excel Workbook?, Delete, Delete Cells, Delete Columns, Delete Rows, Delete Sheets, Entire Column, Entire Row, Home, How To, How To Delete Cells, How To Insert Cells, Insert Cells, International Macro Sheet, Know How, Microsoft Excel, Microsoft Office, Microsoft Outlook, Microsoft PowerPoint, Microsoft Word, MS Excel 4.0 Macro, MS Excel 5.0 Dialog, My YouTube Channel, Office Smart, Office System, OfficeSmart, philippospan, Row, Rows, Shift Cells Left, Shift Cells Right, Smart Office, smartoffice, Spreadsheet, Subscribe, Tip & Tricks.